The Chore Joy of Patchwork. 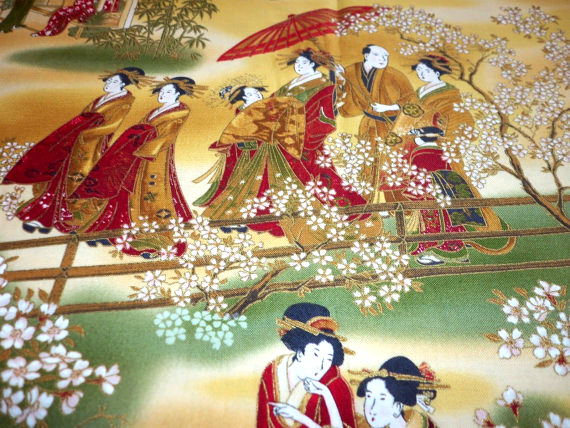 Ages ago I discovered a range of fabulous fabric by Alexander Henry, with a design I particularly liked. The range is called The Ghastlies. The Ghastlies are sort of Ronald Searle style, slightly Addams Family type people, in various settings. 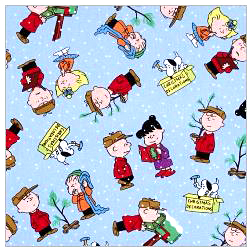 I wanted them all and the only excuse I could think of for having them was for making a patchwork quilt. I bought the majority of them. 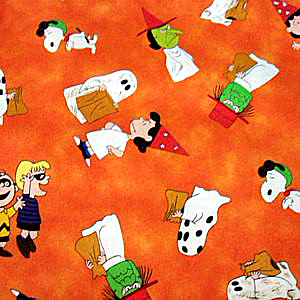 Here are the lovely Ghastlie fabrics. There are also prints made up of details from the cartoons, like the ‘bramble’ print you see below, the trees and the curly Romanesque flowers. My picture isn’t clear enough to show it but the print below shows family portraits, so gives the name of each character. I have several of them in 3 to 5 background colour versions, as with the one below the one below. I rather like the various ‘wallpaper’ ones that are in the Ghastlie set. I didn’t buy all available, just a few, including these two. I like the muted colours used in them. The pattern is busy but the colours are calming. The next is Sebastian, the Ghastlies’ cat. I love that print. The different coloured versions don’t differ in scale, that is just in my picture, the print is the same size in each colour. I love the style of drawing. It reminds me of Ronald Searle’s work. Ronald Searle created St Trinians, with the wicked, badly behaved, raunchy schoolgirls, with stories that were eventually made into movies, my favourite being with the wonderful Alistair Sim as the headmistress. The trees below are also in the picture above. However, the fun was in the selecting and buying of them, making a patchwork is not my idea of fun and I have never made one before. 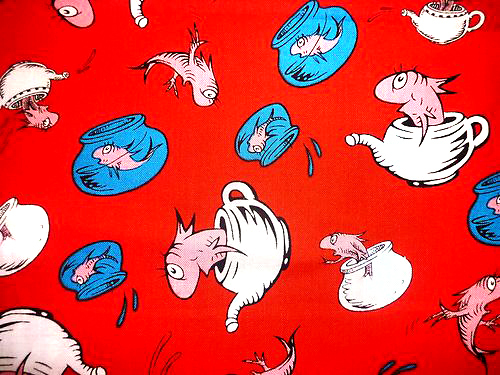 I put it off for well over a year but recently came across the fabric again and felt guilty, especially as I didn’t stop at Ghastlies; my search for them led me to Dr Seuss fabrics and Christmas fabrics and I bought those too. 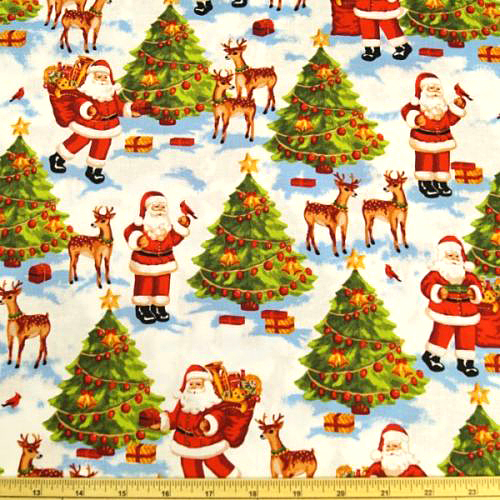 Most of the Christmas fabrics I chose are ones that remind me of Christmas wrapping paper from my childhood and from my daughter’s childhood. 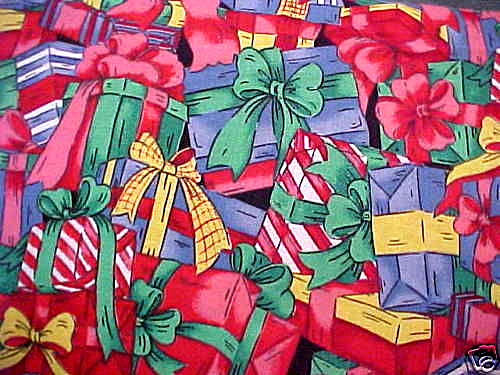 I used to wrap her gifts in standard wrapping paper but wrap all her ‘from Santa’ gifts in cheap wrapping paper without any decorations added, so she would not think they looked like the gifts she got from me, so many of the Christmas fabrics I bought are ones that remind me of that cheap wrapping paper. 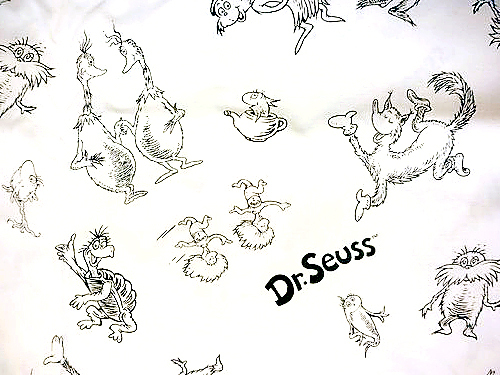 I also learned that I can print my own fabric on my home printer, so I have an idea for patchwork made from printouts, though that one may have to be a panel because, due to the special fabric one prints on and the ink used, those patches will be expensive to produce and then there is the fact that you can’t wash these home printed fabrics too many times without them fading, so not ideal for bedding, better for something that won’t need washed or will only rarely need washed and can be washed by hand. However, they aren’t like the iron on tee shirt patches, which are sort of plastic in texture. If I ever do make that patchwork, I’ll show it to you but I’ll keep the subject matter of it to myself for now. 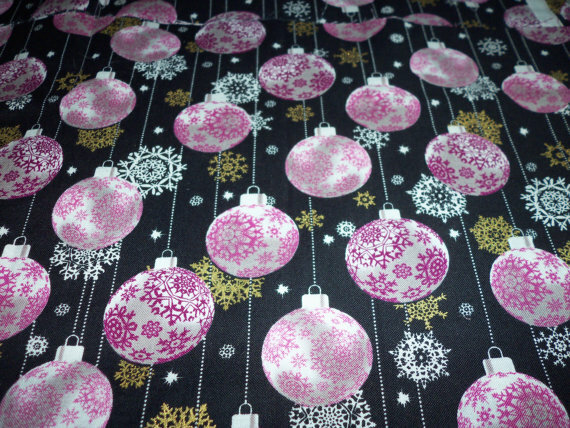 Here are my Christmas fabrics. I warn you, there are a lot of them. 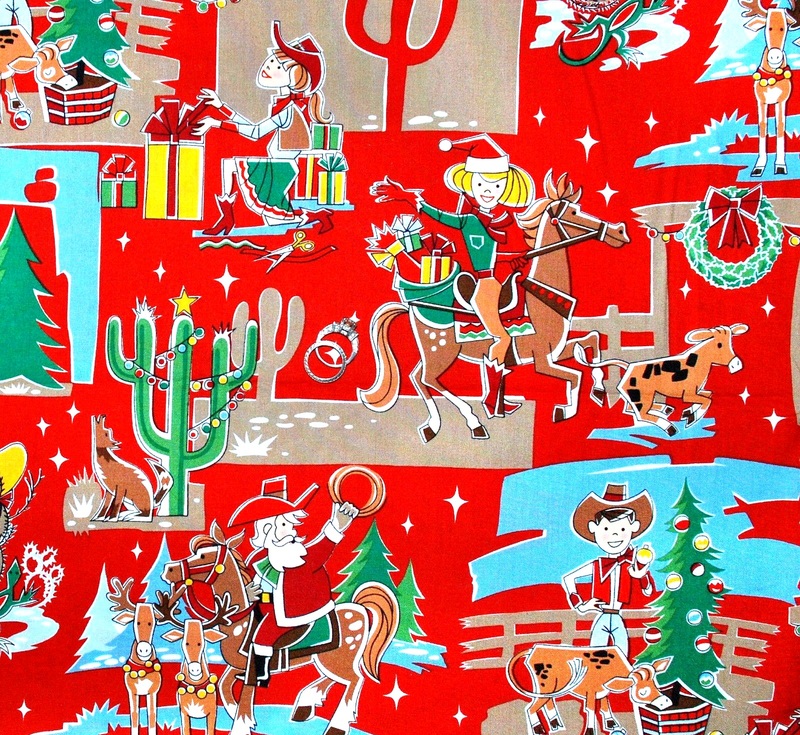 This next one is my favourite Christmas fabric. It makes me feel about 4 years old. 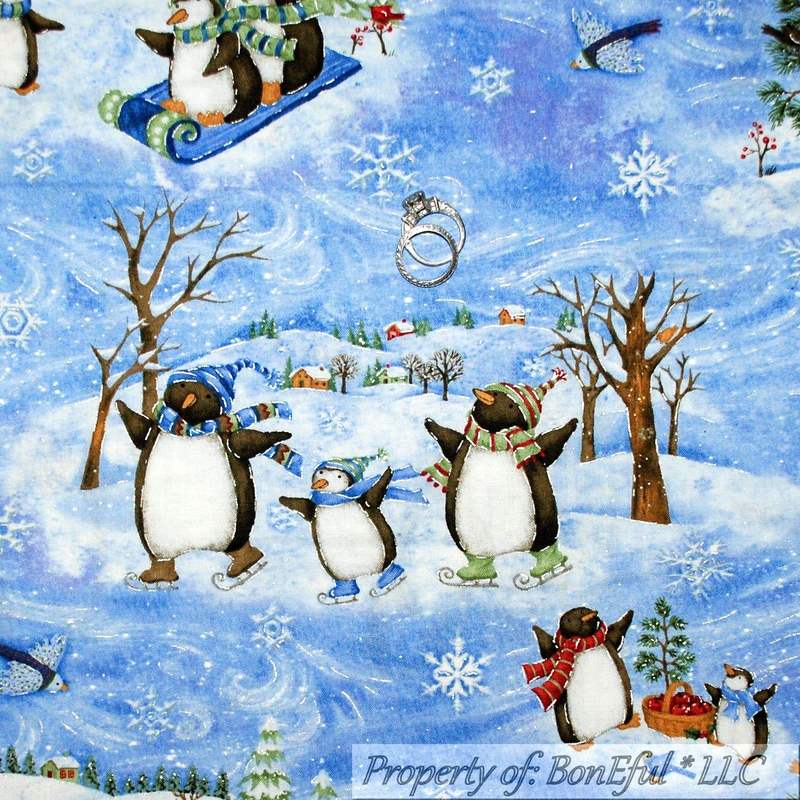 The one below, with the penguins and the tree one below it actually has glitter in it. Glitter, I tell you! It may only last a handful of washes but that will do me. 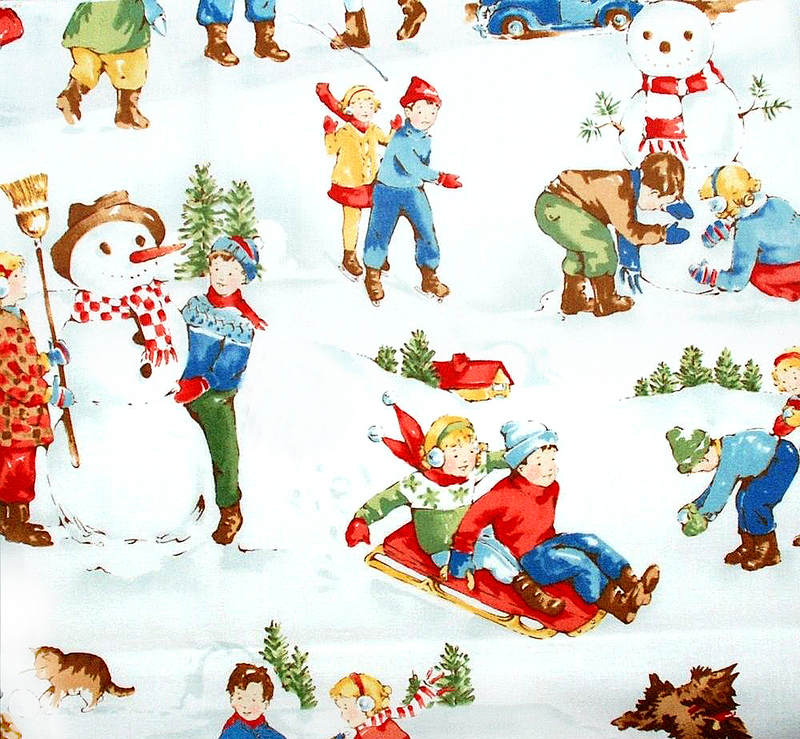 I got those because I remember as a child in the 60s having Christmas wrapping paper with glitter on it that I really loved and made me excited about Christmas and thrilled by that pretty wrapping paper. Back then, paper was carefully removed from packages and saved to be re-used year after year and I cherished the glitter papers. 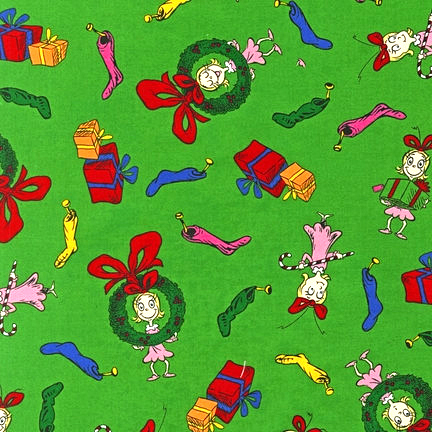 Each year the saved wrapping papers got a little smaller, as the damaged edges were trimmed off, ready for re-use. 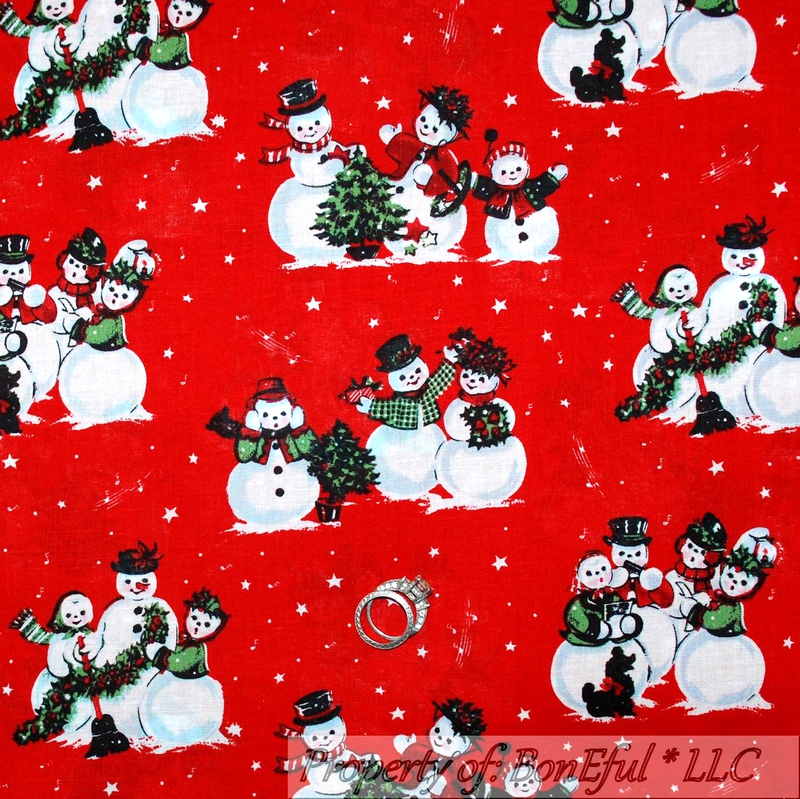 This red one with snow people reminds me so much of cheap and cheerful wrapping paper. I was born in the 50s, so had to have this next one. My daughter liked this next one a lot, it took her back to her childhood. 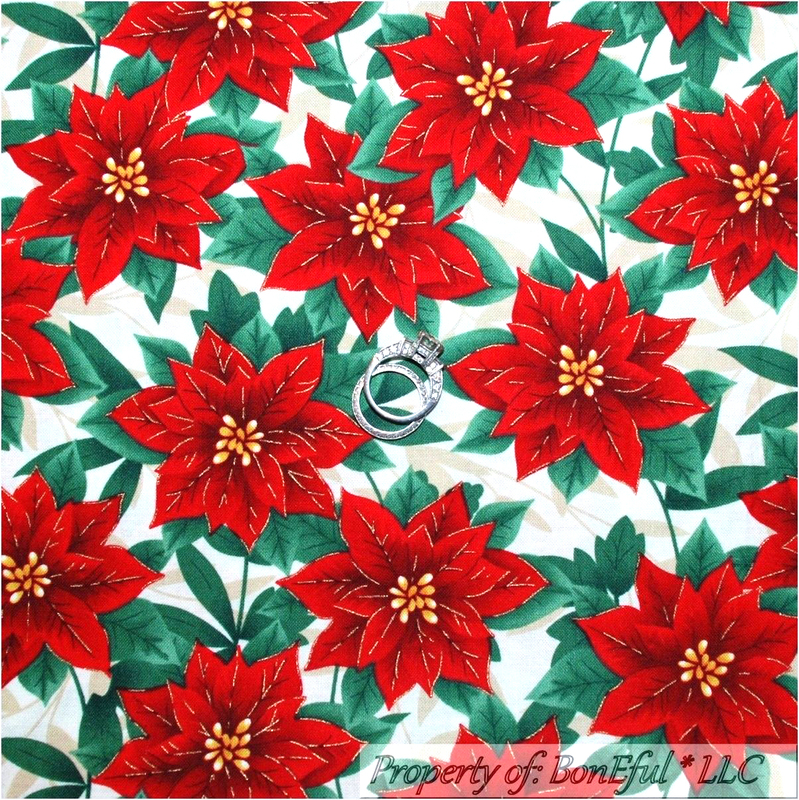 Nice touches of gold on this poinsettia one. I really like rodents and my daughter went mushy over the next two because the mouse reminded her of one of her favourite childhood books, Santa Mouse, where a mouse helped Santa and was eventually given a little Santa suit by him. Snowmen printed to look as though they are cut out of newspaper. I grew up in the time of individually hand blown glass baubles. They were expensive, precious and each year a few would smash and a few new ones would be bought. One didn’t have the option to buy unbreakable and very cheap ones like one can nowadays, so they were very special, treasured items. 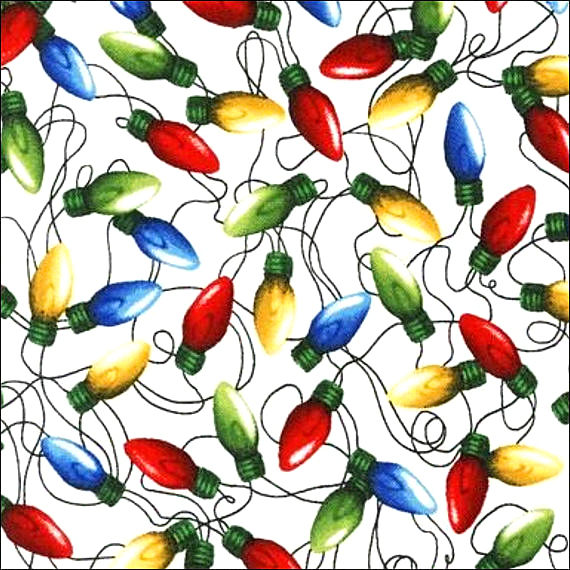 This next two, with strings of lights, are actually a Peanuts/Charlie Brown one. Can’t have too many baubles! More cute little rodents. I’m a sucker for those. 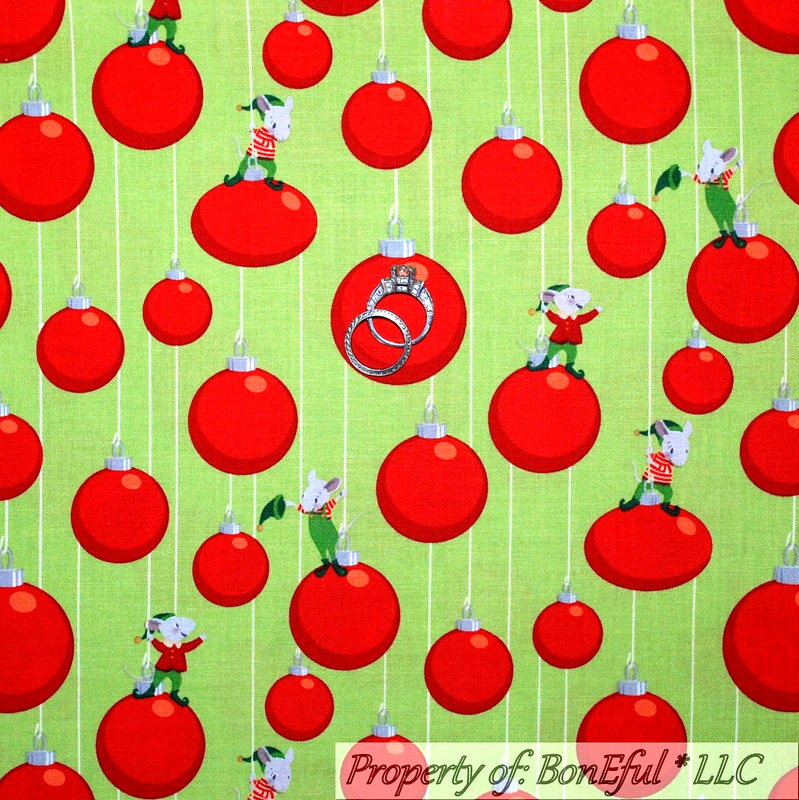 Of course, there are a couple of Grinch Who Stole Christmas fabrics in my collection. 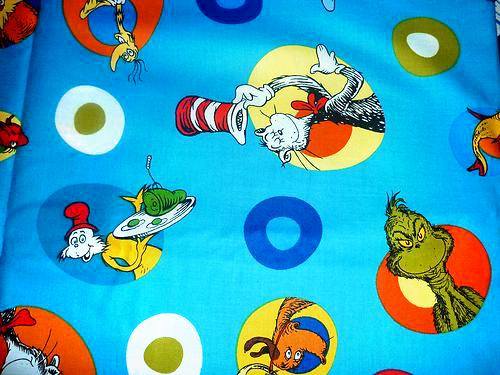 They will also go in the Seuss patchwork. Flower Fairies. Had to have those. Any nativity ones and angel ones I have are to remind me of typical Christmas cards and especially of ones we used to get at primary school at Christmas that were just outlines that we could then colour in. I can remember them surprisingly clearly and seeing one in my mind momentarily makes me feel exactly as I did when I was given a pristine, uncoloured one in class. Some rather odd, scrawny, little Christmas trees, each with a big red light bulb. Something about tin soldiers just says, “Christmas”. The soldier in this next one is a bit creepy, though. His mouth reminds me of those scary, biting dolls in Barbarella. I didn’t notice before I purchased it. 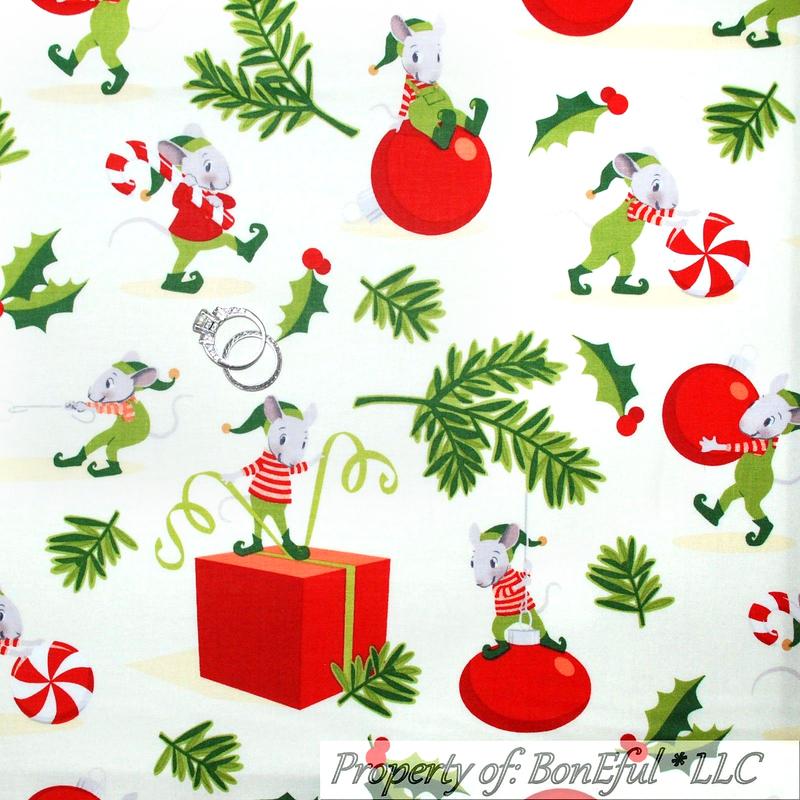 A cute little Santa, unusually, not in red clothing, in three versions, each with a different coloured background. 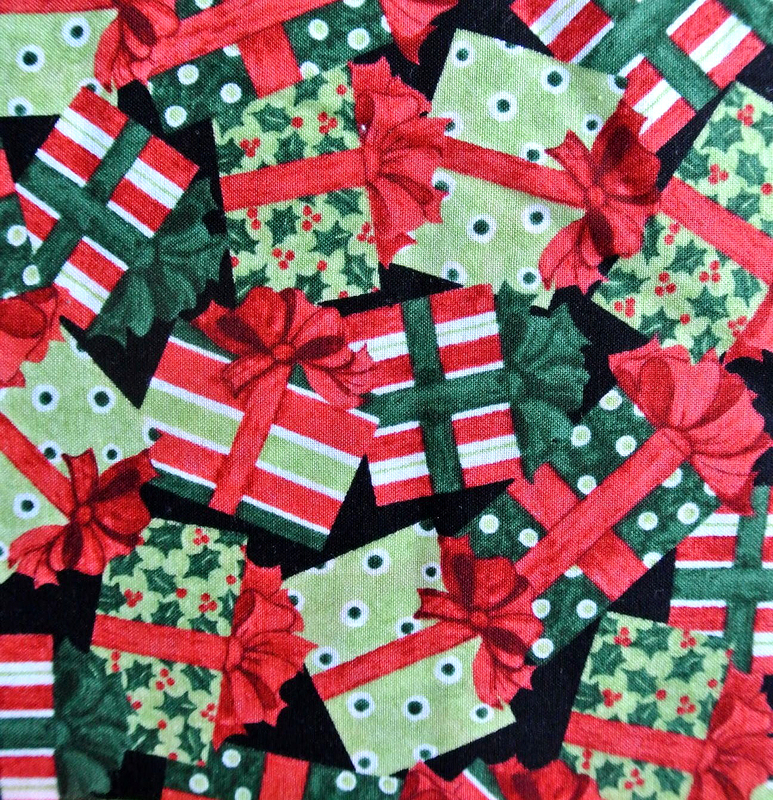 The red and green gifts is another that reminds me of 1950s-early 60s magazine artwork. It has the style of a graphic in an old Homes and Gardens type magazine. 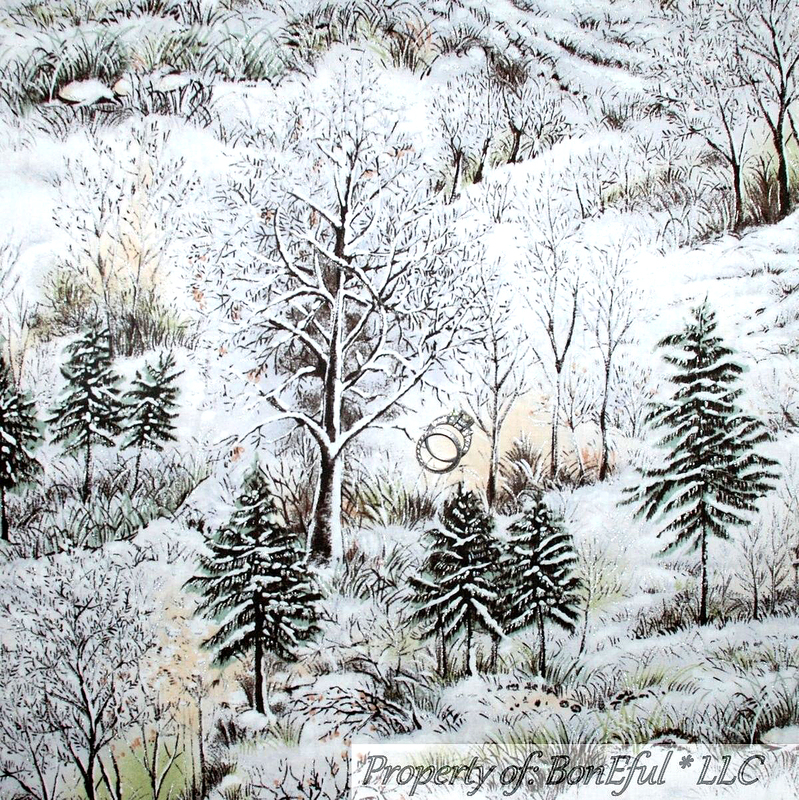 It is both the colours and the style of drawing that evokes that. I especially like the style of the next two. Time for some more baubles. I live in a house that has a garden and, around one side and along the bottom, a 5 acre field. My father, who was a teacher, planted pine trees to sell each Christmas, digging them up to order and selling them complete with roots. He died in 1973 and the trees were then left to their own devices. They are now huge and locally it gets called ‘the forest’, though is actually no more than a tiny wood, so this fabric and one other are to represent that. This next one makes me think of 1950s and early 60s women’s magazines around Christmas time. This is the style of illustration one might see decorating their baking pages or their crafts page. Another to remind me of ‘the forest’ and my daughter whose name means small star. I find it a little odd that the trunks look sort of threaded through the branches. 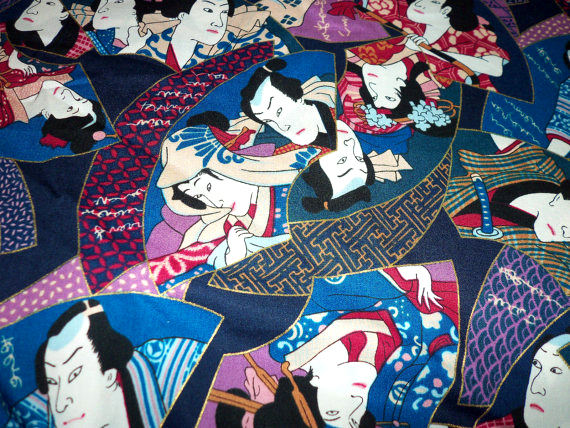 These faces in the next two turned out to be huge, which I didn’t realise until the fabric arrived. A 9.5 inch square is almost filled by one face. 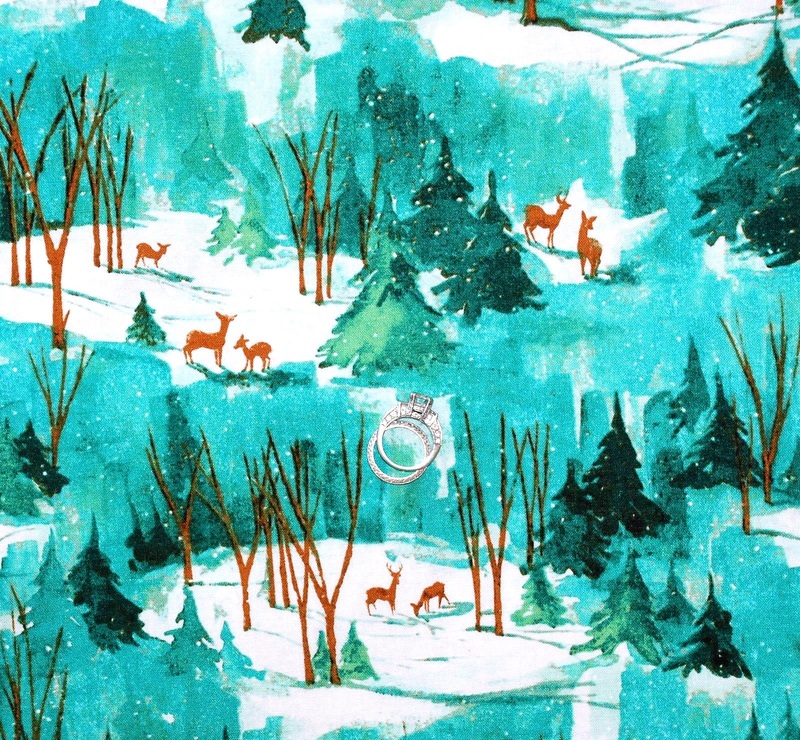 More in cheap wrapping paper style. There is something pleasing about old style caravans in the snow. 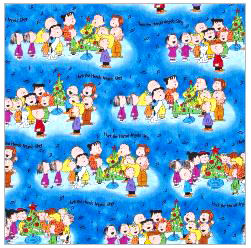 The next four are more delightful Peanuts ones. 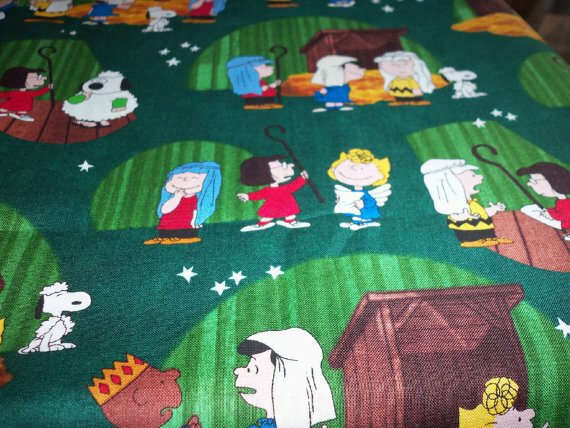 I have the Peanuts nativity in these two colours. This holly one is especially effective. It wows me each time I see it. More baubles but nicely stylised. A very 60s feel to this next one. This next one, with Santa Claus, reminds me of Christmas cards. 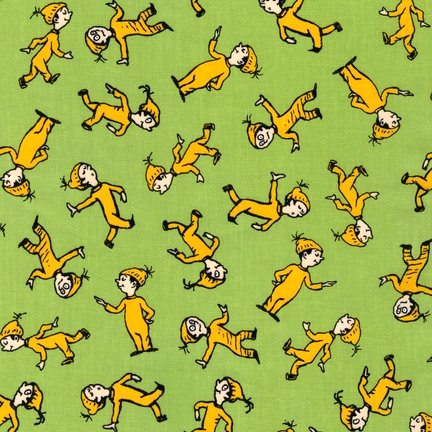 It looks as though someone shook up and poured out a container of elves. 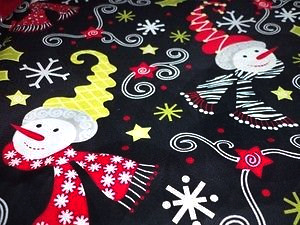 That is most of the Christmas fabrics, around 100 there, though I have a handful more still to arrive from the USA, part of my gift from my daughter, so I don’t yet know which ones. Anyway, one thing that put me off, after I cut out loads of squares of the lovely, printed fabrics, was the thought of cutting all the strips that go round them as an outline, called sashing. 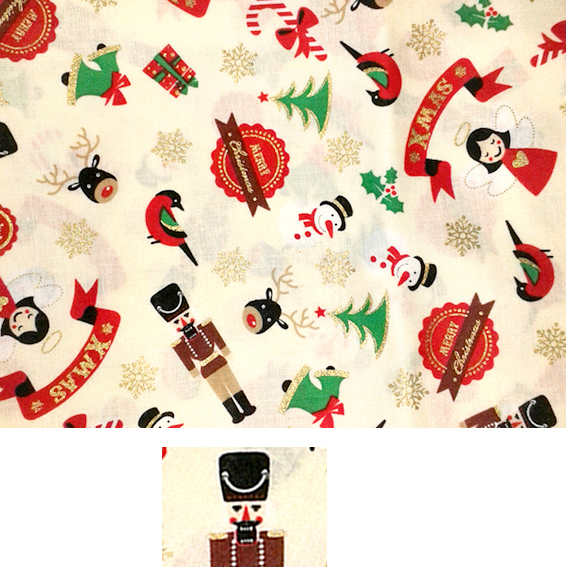 Over Christmas, my daughter borrowed a pair of cordless, electric scissors from the wardrobe department at her work and cut the plain black fabric for the Ghastlie patchwork’s sashing into lots and lots of strips for me. 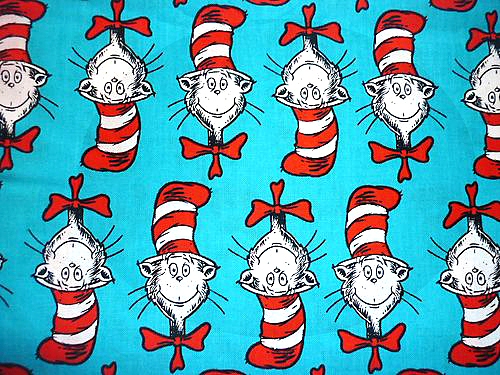 The navy blue strips for the Dr Seuss quilt are cut too but the plain, bottle green fabric for around the Christmas quilt is not yet cut at all. I then went on the hunt for good, electric, cordless scissors. I did very well, I got a pair of Black and Decker ones quite cheaply. The ones my daughter brought home cost about £115 and that would have been out of the question. I’d worked out the size of sashing strips needed for my patchworks, which have 9.5 inch squares (giving 9 inch squares when sewn), so it all got cut into 2.5 inch wide strips of two lengths. I started sewing the sashing around the top and two sides the Ghastlie print squares but, after I’d used up all 141 strips, I realised that not only should I have only sewn them onto the top and one side of each square, not both sides, I also had a size wrong. I now have to unpick 94 side strips and do it without damaging the very expensive fabric used for the squares. Because I back-and-forth stitched about half an inch at each end, to make it extra secure, it means that about half a cm at each end of each strip an utter nightmare to unpick. On top of that, it is black stitching on black fabric, so my 58 year old eyes don’t like it and struggle to see it with any ease and the patterned side has too much black in it to make it easy. 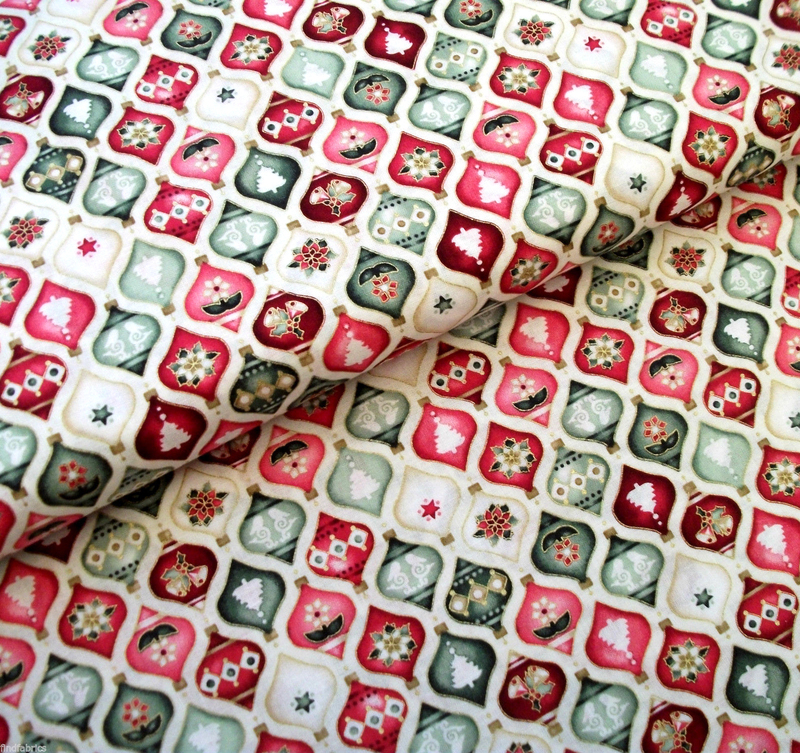 Of course, I have now gone and looked online at sites and videos about making patchwork. I know I should have done it before starting. Before buying too, I suppose. This woman, from New Zealand ‘s gourmetquilter.com, is particularly good and I am now going to do the sashing like she does in this video tutorial, with the separate squares in the corners (called sashing posts), though my sashing and posts will be all one colour. Using corner posts is how it is generally advised to do sashing, for beginners especially, because, when sewing strips of sashed squares together, lining up the seams on those little corner posts helps ensure the correct positioning, so all squares line up, which can otherwise be rather trickier than one might expect. This video she did about sashing is one I find very helpful. Making a patchwork quilt is certainly not quite the quick and easy thing I thought it would be, not even when using big, 9.5 inch squares. 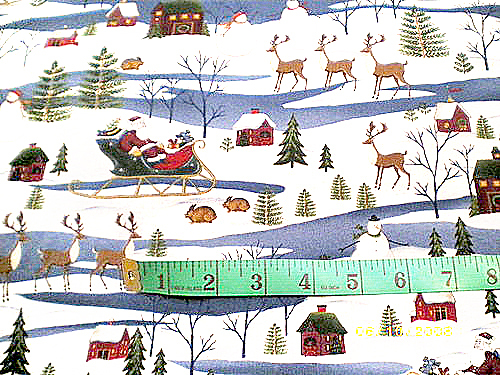 By the way, I am using inches in my quilt making, instead of centimetres, because some of the templates I am using came with just inches on them, probably because that is all they use in the USA and the templates I have are mostly aimed at that country’s quilters. It is rather a labour of love and very time consuming, even if sewn by machine. Sewing is just one part of it, there is so much more to it. It is brain melting to try to calculate how many pieces are needed, it takes a lot of careful planning, a ton cutting , sewing and ironing and that is just the patchwork layer. I have to add a layer of batting (wadding) and a cotton backing layer, then cut and sew binding all around the edge and a king size quilt has a long, long edge, then I need to actually quilt the darned thing. I knew it would need a backing, I vaguely had an idea that it might need a layer of something in the middle, I had not for the life of me thought it would need a bound edge or that I’d have to quilt all over the thing to hold the layers together and that job is something I am dreading on king sized quilts. I also didn’t think about the stuff I’d need to buy; that batting is horribly expensive and, of course, I want to make king sized quilts (which I actually have no real use for), not dinky little wall panels or bags or ornamental fancies, which are not my kind of thing at all. 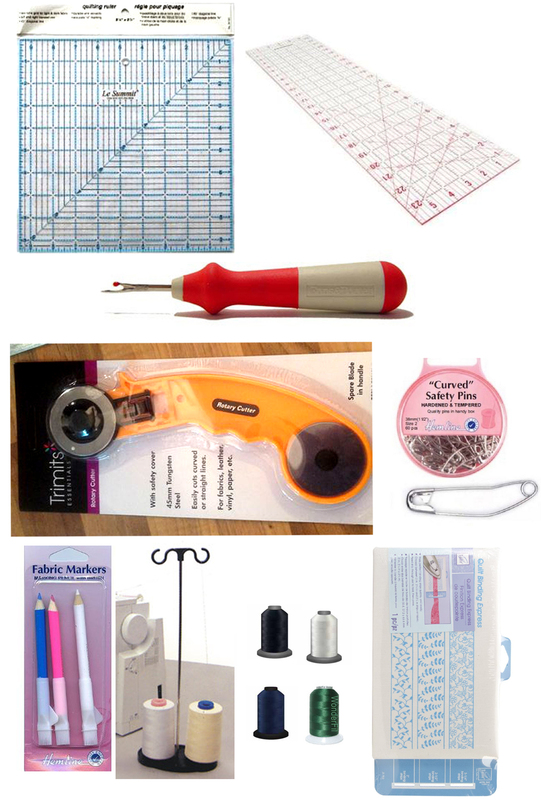 I’ve also had to buy a new cutting mat, a rotary cutter, quilting pins, lots of thread, the metres of cotton sashing fabric, the expanse of cotton for the backing, acrylic templates and rulers, scissors sharpener, seam ripper, £50 worth of thread (5 colours) etc. Luckily, my daughter is going to make me a neat, square, table top ironing mat, so I only need to buy a heat reflective cover for that, and she will cut me a few acrylic templates so I can eventually cut smaller squares from the left over fabric, for other quilts. A few of the purchases can be seen in this photo. On the bottom row you can see a double cone thread holder, this is required because thread is cheaper bought on cones and I will need a lot of each colour but cones don’t fit on the sewing machine, so a cone holder is required. Luckily, this one was surprisingly cheap. I saw many at 5 times the price. The last thing in that picture is a tiny ironing mat that one threads strips of binding fabric through, which helps one iron them accurately folded. I will need to make miles of binding, so it seemed worth buying. Bear in mind as well that almost all these printed fabrics had to be purchased from America and I am in the UK, so shipping was very, very costly, sometimes more than doubling the cost of the fabric in the package and often I got hit with import tax too and, on top of each import tax bill, there was the delivery company’s £8 fee for passing my payment to the Customs’ payment department for each package requiring customs duty payment and it amounts to quite a few packages, to say the least. Annoyingly, the Customs charge is not calculated just on the value of the contents of each package but also on the cost of the postage, which is the bit that really cheeses me off. Anyway, this all made the fabrics exceedingly costly. These are going to be very, very, very expensive quilts. 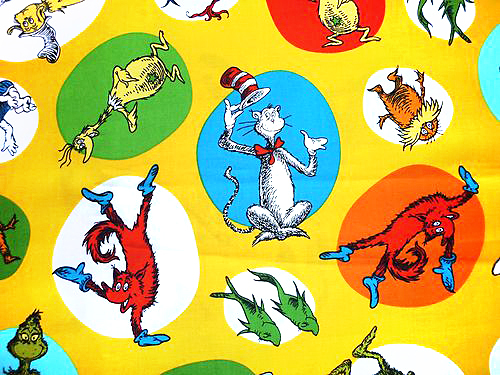 Before I continue, I may as well show you the Dr Seuss fabrics I have. Not nearly as many as the Christmas ones, of course, though there are about 6 more I’d like to get. 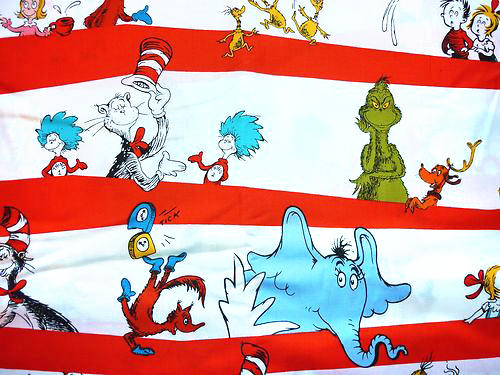 Fortunately, unlike Christmas ones, there is a limit to the number of Dr Suess ones available. 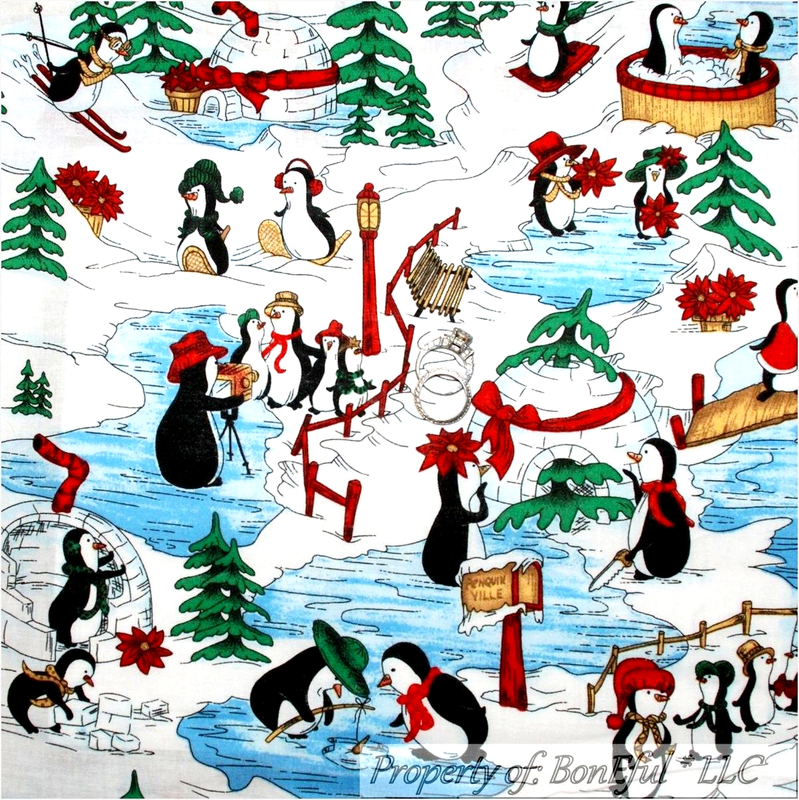 These fabrics are often produced in relatively short runs, not made year after year, so you there are never all that many of this theme around and some are no longer available anywhere. On top of that, I have more fabric than I need, a lot more. A fat quarter is a sort of quarter yard in that it is a half yard that is then cut in half width-wise, so, rather than being a narrow strip that is a quarter of a yard in length, it is a more squat rectangle of fabric. A fat quarter will give me two of the big, 9.5 inch squares I want for my quilts and leave enough for two smaller ones as well, but several of the fabrics could only be found in half yards or metres and some in full yards, so I have enough to make more than one quilt of each range of fabrics. 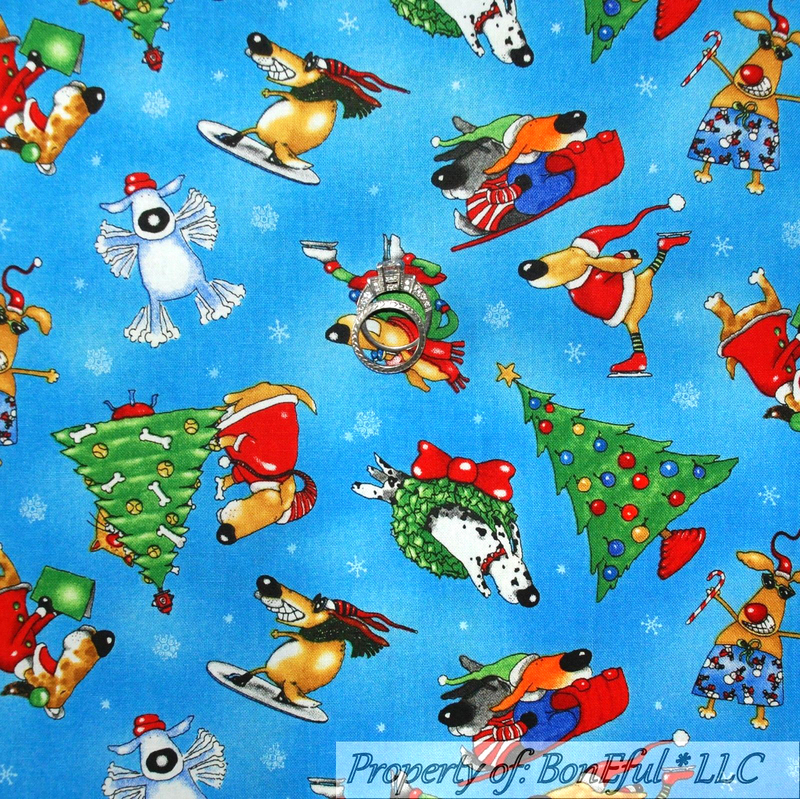 Since the subject of the fabrics and the need to get around to getting these patchworks made, came up a couple of weeks before Christmas, my daughter asked if I’d like a few more fabrics as one of my Christmas gifts. I immediately went looking for ones for her to get me and, of course, not only found some for her to buy, I also ended up buying many more myself, mostly Christmas ones, an absurd amount of Christmas ones. Way too many for one quilt. 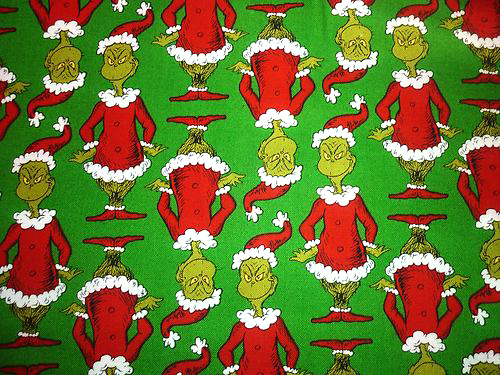 I think I could easily make two King size quilts without even repeating any of the Christmas ones. 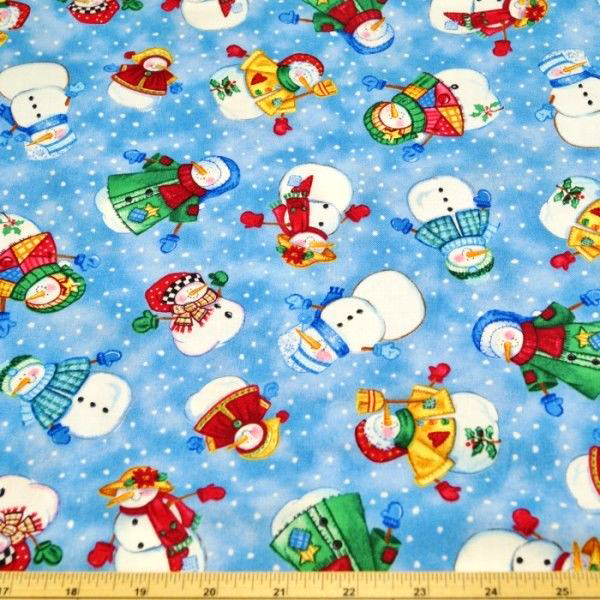 I will certainly have enough to make several Christmas quilts. This means I really have to make more than one and try to sell the extras to recoup some of the money that I spent and have been too scared to work out the total of. I don’t even want to make my own quilts, let alone extra ones. I am hoping that once I make one I will have got the hang of it and it will have become quick and easy, so I won’t object to doing the extra ones. I now underestimated the knowledge required, so realise that I have not planned well. Actually, have not planned at all, so now that I have learned more about it, I have to unpick all those flipping strips, iron all the pieces flat again, carefully work out sizes and numbers and start again properly but I must not use that as an excuse to put it off for another year or two. 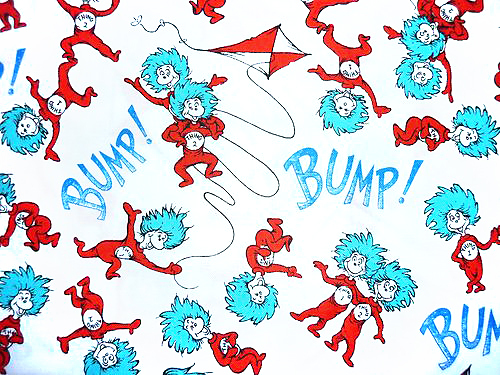 I MUST get these quilts done. 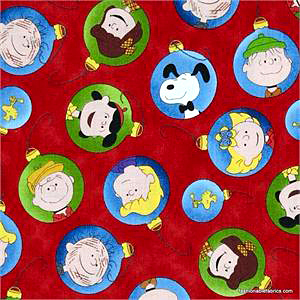 Now, while my daughter told me, “Don’t by any more fabrics!”, when selecting a few for a Christmas gift for me, she found herself sucked in by the Peanuts character ones she kept coming across and then she ended up buying herself a big selection of those,so that I can make her a quilt out of them (I offered, she didn’t just presume). Like mother, like daughter. 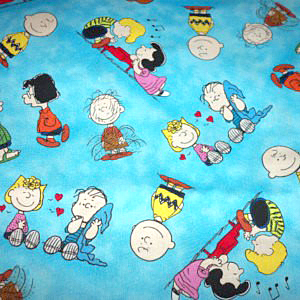 So here are my daughter’s Peanuts fabrics. 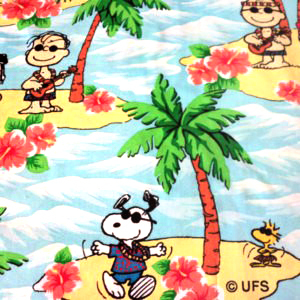 This aloha one was especially expensive, I guess because it is out of print now. 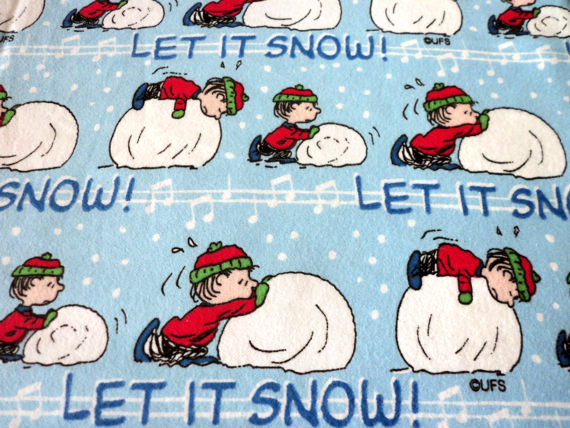 There isn’t a season, a festival or celebration that isn’t portrayed in a Peanuts fabric. 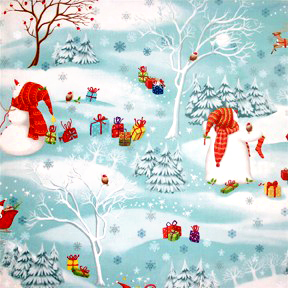 Now, my guilty secret is that during my most recent browsing, when both my daughter and I selected and bought more Christmas fabrics for me, I also bought six with a Japanese theme to them, which means that, eventually, I will have to buy several more so that I can make a Japanese themed quilt. I get somewhat obsessive when it comes to things like this, I lose all self control and common sense. 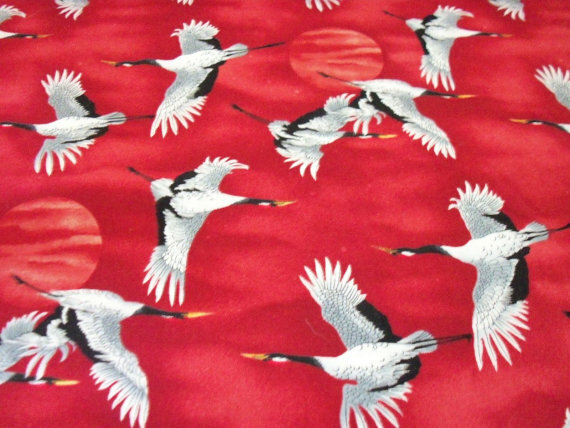 This is why I went from wanting a kimono, to obsessing about them to having so many that I simply had to go into the business of selling them. 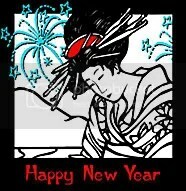 I will finish this blog post with the three Japanese ones I have so far. I really ought to be making practise pieces, instead of blogging, so I can get all these made into big patchwork quilts. Maybe tomorrow evening. 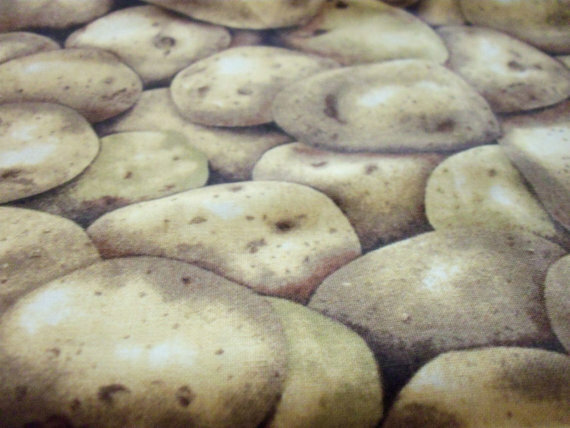 Oh, and just before I go, a rather random one, a cotton print of potatoes. 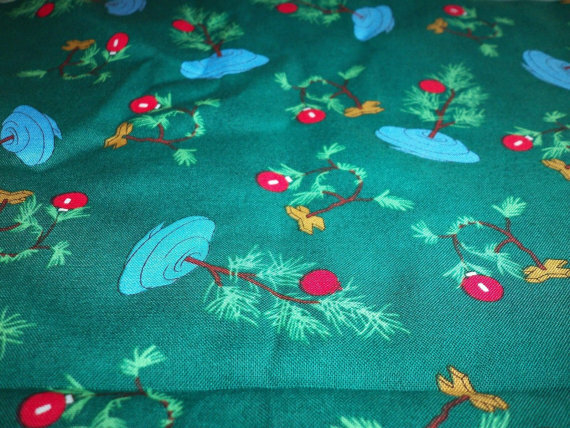 Who wouldn’t want fabric with a potatoes on it? Not what usually springs to mind when one hears talk of a potato print. I’ll tuck it away and, if I do get into making quilts and not hating it, I may make a fruit and vegetable based one, as there are lots of fruit and vegetable prints like this one.